As a preventive measure against accidently leaving anyone in the heart of Lazio on one of our many field trips outside Rome, each member of the 2017 American Academy in Rome Classical Summer School was assigned a Roman emperor, whose name upon getting back to the bus we would shout out, one-by-one, in the chronological order of their reigns ("Augustus!" "Tiberius!" and so on). Being alphabetically last of twenty-something members I was assigned 3rd c. C.E. emperor Macrinus. That's me pictured with his bust above. I'm embarrassed to admit that I had never heard of Macrinus before this summer. His life and reign is now just one of many, many reminders from this summer that Romanitas extends far beyond, both before and after, the rather slender part of Roman history in which my scholarly interests rest. My conceptions about Roman culture and identity were challenged every day when, either in expertly led tours of sites and museums or in classroom lectures and seminars, we studied the various and complicated forces that have shaped not only ancient Rome but also our understanding of it today. A recurrent theme of the summer that I found particularly interesting was the influence of the Italian Fascist era on the preservation efforts of the monuments and spaces we cherish today. This was one among many areas of expertise of our wonderful magistra, Genevieve Gessert, whom I had the very good fortune to meet before she steps down from her directorship of the Summer School next year. One truly unique experience from this summer was the virtual reality tour, headset and all, of the Roman Forum (because, clearly, four visits to the real Roman Forum were insufficient) led by Bernard Fischer, Professor of Informatics at Indiana University Bloomington. The American Academy in Rome attracts just such talented visitors and residents into their vibrant intellectual and artistic community, and some of my fondest memories of this summer were my conversations with the resident artists, scholars, and musicians. This is not even to mention my colleagues, now friends, of the Summer School, whose company made even cramped tombs and the universal dearth of air conditioning in Rome enjoyable. I sincerely thank the American Academy in Rome and all of the instructors and guest lecturers of the Classical Summer School for a remarkable experience. 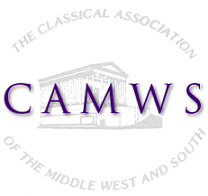 This experience would not have been possible without the generosity of CAMWS. The Mary A. Grant Award every year provides a fortunate student with the financial means to have the same vivid encounter with the Ancient World as I did this summer. Lastly, I would like to mention that Mary Grant was a longtime Associate Professor of Latin and Greek (1921-1960) at the University of Kansas, where I recently received an M.A. in Classics. I am, therefore, in especially great debt to Professor Grant's lifetime service to the study of Classics.